CAJON PASS, CA -- A Huntington Beach police officer's life was saved by his badge after a suspect opened fire during a chase that ended in a fiery crash in the Cajon Pass early Friday morning. The chase started around 1:30 p.m. in Huntington Beach near Yorktown Avenue and Bushard Street. Authorities received reports of domestic violence and headed to the scene. When they arrived, the suspect fled in a car. At one point, the suspect made a U-turn, got out of his car and opened fire on police, striking one officer in the chest. But the officer was not injured because the bullet struck his badge. "(It was) one shot in a million. I mean, where the bullet could have struck and that's where it hits - you can't even describe. You wouldn't even expect it to hit probably the smallest area of your uniform," HBPD Officer Jennifer Marlatt said. The suspect was able to evade police after the shooting and then was spotted in Costa Mesa. Officers followed him until he got on a freeway and California Highway Patrol officers took over. 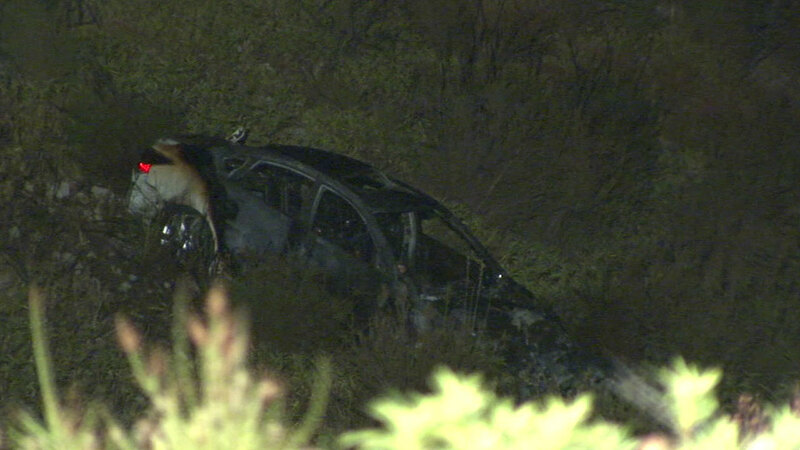 Authorities followed the suspect for more than 70 miles into the Cajon Pass on Interstate 15 near the Cleghorn Road exit until he careened off the road down an embankment, where his car burst into flames. It was unclear what led the suspect to lose control and fly down the embankment. The person died in the crash. Authorities said the coroner will determine the exact cause of death.